This is what you see when you visit about:internets. This is freaking awesome. Years ago there was an idea to include the kitchen sink in Mozilla (you can view it here, not sure if that works in IE). It was a good idea considering it had everything else at the time. I initially thought it was written using <canvas/>. I tried the typical view-source:, but in this case it doesn’t seem to work. The performance was really smooth with minimal CPU, more than <canvas/> typically allows. Now I was curious. It’s using the actual Windows screensaver (which is why it doesn’t work in Vista I presume). I hope for the Mac and Linux port they bundle jwz’s excellent XScreenSaver. Due to jwz’s impact in browsers and open source, I think there would be even better easter egg. From a quick look at the code it seems it’s not hard to do since every tab is it’s own process, it’s essentially just running the process inside the view. 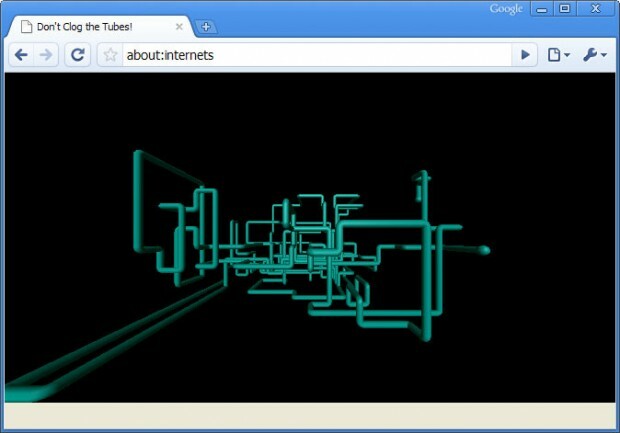 For those who don’t understand why this is all so amusing, read this Wikipedia article about the “Series of Tubes“. It will only kill a small percentage of brain cells since it’s just the Wikipedia article explaining it. There are other Tubes references as I mentioned last night. Thanks to those who left a comment in my last post for pointing this out. By the way, check out Brendan’s post on TraceMonkey performance. He did a better comparison at actual JS performance. I only looked at selectors really quick. This is what you see when you visit about:internets. This is freaking awesome (και λίγα λες) It’s using the actual Windows screensaver (which is why it doesn’t work in Vista I presume)…. Yeh, it really doesn’t work with vista. Doesn’t work here either, in Vista. Tab has a different text “The Tubes are … ” something, but no screensaver. Correct. Vista doesn’t include the screensaver so it doesn’t work. Technically if you put another screensaver in the Windows Screen Saver directory with the name sspipes.scr it should run that. This is a known issue (even referenced in the code). No one in their right mind would be using Vista. I tested this before on VMWare on the Mac for Windows XP SP3 and nothing happened, but sure shows off Google’s awesome sense of humor! The Kitchen Sink ‘hack’ in Mozilla is actually just a google search using the ‘I’m Feeling Lucky’ option.